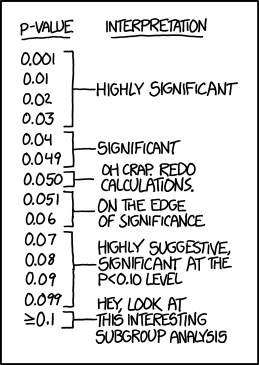 If all else fails, use “significant at p>0.05 level” and hope no one notices. I can’t say that I ever thought about doing this, but I can admit feeling enormous stress proofreading for “less than” signs pointing the wrong direction – an anxiety that may have been justified on more than one occassion. This entry was posted in Follies of the Human Condition and tagged Linkonomicon, p-values, randall munroe, science, statistics, xkcd. Bookmark the permalink.